We understand that today’s startups are engaged in a game of musical chairs, and we design our strategy to retain a chair for our entrepreneurs to dominate new markets. The unique formula for a winning company rests on four pillars: unit profitability, restrained burn rates, capital stability, and contingency planning. Being able to achieve product market fit and positive return on sales, without massive amounts of capital, is highly predictive of success and the best inoculation against capital “bubbles”. This isn’t to say that companies should be undercapitalized, but scarcity and respect for capital do drive innovative thinking and focus. Both are keys to success at any point in the cycle. We believe the best foundation is a syndicate of two institutional investors possessing the dry powder and conviction to support initial growth and the credibility to attract high-quality growth investors when it’s time to pour on the gas. Even in buoyant times, a precautionary assessment of the unexpected remains valuable. For example, if you’re expanding nationally while still trying to prove product market fit or still seeking solid unit economics. In this instance, your burn is likely very high, making your reliance on attracting additional capital more absolute, and potentially more difficult. While unit economics, lean startup philosophies, capital stability and precautions are unsexy, it is critical for startups to ensure that they are supported by all four pillars when the inevitable cycles of the market turn. After all, to win at musical chairs, you need a firm seat. Big Data vs. Thick Data? Combining the two approaches can solve many of the problems that each category of data faces on its own. …Left even more uncertain than before the survey, the CMO decided to commission a study to come up with thicker data: he wanted insights from spending time with consumers in their homes and daily lives. …a major shift in consumers lives was apparent. Not only had their food habits changed, but people’s whole social lives were different. Stable family routines were dissolving, and predicting what next week would look like was increasingly difficult. …the experiences that the company’s stores offered were out of sync with the reality of the consumers. Instead of focusing on lowering prices, the supermarkets future strategy was built on a different idea: building distinctive shopping experiences that fit into customers’ fragmented lives. Design is a way of thinking, of determining people’s true, underlying needs, and then delivering products and services that help them. Design combines an understanding of people, technology, society, and business. The production of beautiful objects is only one small component of modern design: Designers today work on such problems as the design of cities, of transportation systems, of health care. Apple is reinforcing the old, discredited idea that the designer’s sole job is to make things beautiful, even at the expense of providing the right functions, aiding understandability, and ensuring ease of use. Good design should be attractive, pleasurable, and wonderful to use. But the wonderfulness of use requires that the device be understandable and forgiving. It must follow the basic psychological principles that give rise to a feeling of understanding, of control, of pleasure. These include discoverability, feedback, proper mapping, appropriate use of constraints, and, of course, the power to undo one’s operations. These are all principles we teach elementary students of interaction design. …programmers rush to code without understanding the people who will use the products. Designers focus entirely on making it all look pretty. 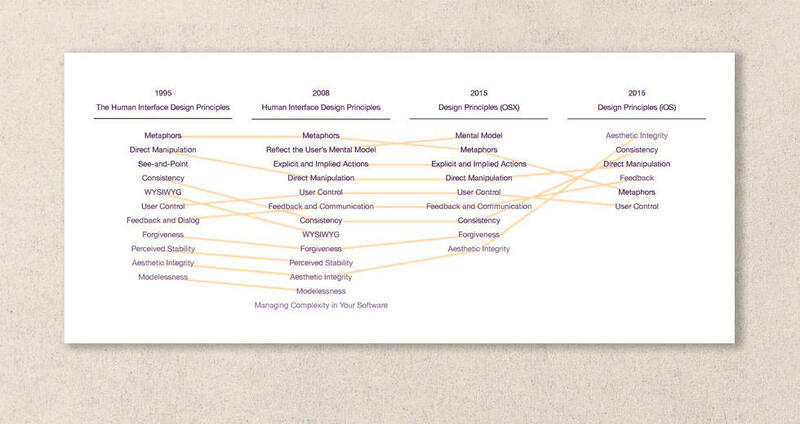 And executives get rid of user experience teams who want to help design the products properly and ensure the products are made usable during the design phase, not after manufacturing, coding, and release, when it is too late. These uninformed company executives assume all this up-front design research, prototyping, and testing clearly must slow down the development process. Nope. When done properly, it speeds things up by catching problems early, before coding even begins. The result of avoiding proper design methodology? Higher costs for service lines, for help. And the eventual defection of unhappy customers who may publicly still sing the praises of Apple’s simple interface while forking over the money for a different brand phone that they hope they’ll be smart enough to actually be able to use. Usamos categorías dicotómicas como si fueran útiles, además de ineludiblemente verdaderas; creemos que son universales y para todo el mundo tan preclaras como para nosotros. Pero no es verdad. Son categorías ineficientes, inconsistentes (que es peor calificativo para una taxonomía) y retrógradas. Y no son las únicas, claro está. Uno de los grandes límites posturales para la innovación es –precisamente– el de aplicar matrices conceptuales del paradigma viejo para poder darle sentido al nuevo. Eso nunca funcionará. El nuevo modelo exige nuevas matrices. … El par online-presencial es altamente ineficiente para entender el fenómeno social de las redes sociales. Aunque sea verdad que las redes sociales son digitales, esa condición no es su principal definición. Quien mira las redes sociales desde esa matriz no está asistiendo al fenómeno ni tiene ninguna chance de profundizar en él. Lo que se ha modificado esencialmente es la manera de relacionarse de las personas. Quien va a innovar tiene dos alternativas: o crea las matrices conceptuales que le darán sentido a su propuesta o se caga en el sentido de su propuesta y sencillamente se limita a ponerla a andar. Lo que no puede hacer es pretender justificar el sentido de lo que propone con matrices conceptuales que no entienden lo que propone y que están siendo superadas con esa propuesta. Por eso cuando miramos … con inquietud innovadora, debemos evitar caer en las telas de las matrices conceptuales ineficientes y paralizantes. No aceptemos que se nos analice desde desajustadas matrices que nos impiden ver lo que ellas mismas no quieren ver. El problema es político y no es menor. Si te propones construir una experiencia … nueva, transformadora, tienes dos caminos. Uno, simplemente hazlo; y hazlo a tal punto que al final sólo sea la experiencia que has logrado producir la que luego hable por sí misma. innovar no es ese ejercicio ingenuo y mágico de que se nos ocurran de pronto cosas nuevas, que más frecuentemente acaban siendo apenas raras. Los procesos disruptivos de valor no surgen de esos “insight” que parecen metahumanos. Al contrario, suelen ser corolario de construcciones teóricas bien entramadas, con justificaciones pesadas y esfuerzos culturales de abstracción y separación nunca pequeños. - A la presión social en general. - A quedar bien con otras personas que no seas tú mismo. - A los y las señoritas de banco que te ofrecen aumentos de crédito si no los necesitas o no los puedes controlar. - A tus prejuicios sobre el dinero. - A ser la víctima de la perpetua crisis. - A la flojera y las respuestas fáciles. - A las soluciones perfectas y al miedo a los errores. …the world would be well served if the mechanics of charm were studied with particular energy by those with the best ends in mind. What, then, are some of the leading constituents of charm? Being charming isn’t simply a nice optional extra. It’s central to dealing effectively with practical problems. We’re so often held up by difficulties with other people, who we struggle to persuade, motivate and get on side. Charm is a major mechanism for having an impact. The more important and worthwhile our objectives the more important it is to be able to deploy charm to further them.